It really is about more than just the World Series. Sure the tournament brand proudly owned by Caesars Interactive may have started it all, but now you’ve got Venetian Deep Stacks, the Wynn Classic, Binion’s Classic, Aria Classic, Rio Deep Stacks, Caesars Megastacks, Bellagio Cup … the list goes on … but all are competing for players, and apparently all you need is a casino property and a poker cliche … and maybe 110-degree weather outside, and voila — tournament success awaits! LOLs notwithstanding, to better understand the impact of live events on the poker economy, and to assess the scope of WSOP and non-WSOP summertime Vegas action, we looked at 13 different series(es?) held at 10 different casino properties from mid-May through mid July … accounting for 722 tournaments total, nearly 230,000 entries (not to be confused with number of players) … making for more than 1,000 tournament days (whoa, that’s a lotta staff somebody’s gotta manage) in just one city. The Hollywood Poker Open was notable, but probably also an outlier; still, might this one-off just before the WSOP main event reveal a possible a soft spot in the tournament economy at the $2,500 level in late June? Full results so far here, follow the action at wsop.com. Follow live updates over at the WPT site here. Wow, so much big action going on today. I really can’t think of a comprehensive way to follow it without tuning in to a lively collection of poker-player twitter feeds. Obviously it’s Day 6 of the WSOP main event … and we’re all starting to wonder just how deep @DonkeyBomber and several others (Peter Eastgate, Dennis Phillips, Joe Sebok, Phil Ivey, Elky, David Benyamine) can go. Click here to follow the live updates on WSOP.com. Another huge table? Jordan Morgan drew Phil Ivey and David Benyamine’s table. All are top pros but very quiet players who rarely speak at the tables. I guess that’s why they’re not on the featured TV table. And then down the hall in the Brasilia room, @taopauly and I are looking to take down the WSOP Dream Team Poker team title and then some. Today is also the start of the Venetian Deep Stacks main event — a $5k that looks to have lots of WSOP main event bustouts in the field. And Team Pokerati will have its representative in @Tbonezz111. 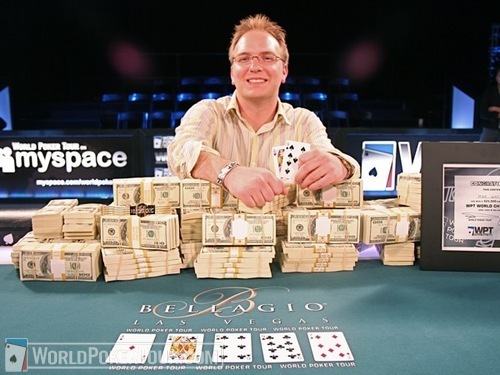 It’s the biggest event Troy’s ever played in; he got in on a $130 satellite to a mega-satellite … so should be fun to see if he can make a run for the bubble and then some. Lastly, the $15k Bellagio Cup V main event starts today. Should be interesting to see who plays (and who doesn’t, opting instead for the Venetian action). You can follow those updates at WorldPokerTour.com. Wheee! Great way to start the week … and bring the big poker summer to a close. Anyway, the final table looked promising… Several pros made it, and it looked like David Benyamine was going to take it down and add two bracelets (ugh) to the WSOP bracelet he won this year. But 24-year old online pro Mike “SirWatts” Watson’s luck skillful play got in the way, and a brand new name was added to the list of WPT millionaires. The action will be shown – dates unknown – on Fox Sports. Next stop on the World Poker Tour: The Bike in Los Angeles at the end of August. Michael Binger said she was due … and sure enough, Clonie Gowen got it good — not at the WSOP, but across I-15 at the Bellagio Cup IV, in a $5,000 NLH event that drew 235 runners. Awesome. Congrats, Clonie! I knew you had it in you, regardless of your status with Full Tilt … Seriously, we should be like best friends again and hang out all the time.